The mountains of Northern New Mexico are a colorful sight as Autumn comes to a close. 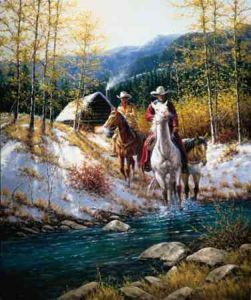 These men are leaving the comforts of their cabin after an early snow in search of cattle that haven't made it out of the high country to pastures below. While on their search they will ride the fences and make any necessary repairs before winter sets in. It's all just a part of the job for these two men one "Morning in New Mexico."